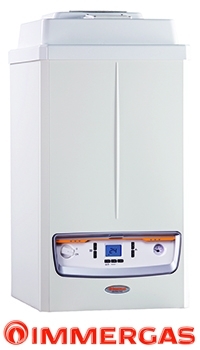 The Immergas Victrix Pro Condensing Boiler is a modular condensing boiler with a 111 kW heat output for heating only. Wide modulating ratio up to 5 boilers in cascade installation, high performances with reduced consumption thanks to the 1:10 modulation range and high efficiency, the new VICTRIX PRO boiler is the ideal solution for light commercial solutions in residential and commercial buildings. The new design, compact and linear, with a vertical sliding door protecting the control board, makes its installation easy even in residential buildings. Thanks to low emissions of carbon monoxide (CO) and nitrogen oxide (NOX), Victrix Pro 120 1 I belongs to class 5, the most environmentally-friendly class established by the European standards (UNI EN 297 e UNI EN 483).